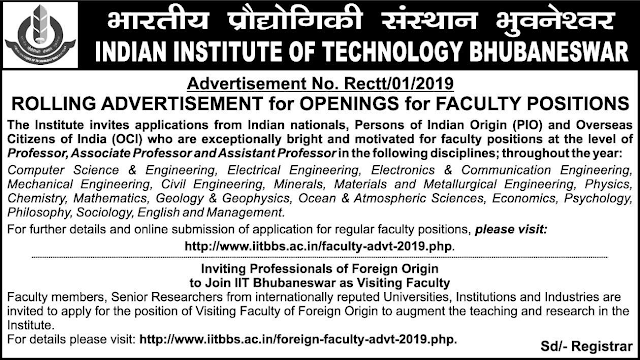 IIT Bhubaneswar has advertised in THE HINDU newspaper for the recruitment of Teaching Faculty- Professor / Associate Professor / Assistant Professor jobs vacancies. Interested and eligible job aspirants are requested to apply immediately from 13th February 2019. Check out further more details below. About College: Indian Institute of Technology Bhubaneswar (IIT Bhubaneswar or IIT BBS) is a public engineering institution established by the government of India in 2008, located at Bhubaneswar, Odisha, India. It is one of the eight new Indian Institutes of Technology (IITs) established by the Ministry of Human Resource Development, Government of India under The Institutes of Technology (Amendment) Act, 2011 which establishes the eight new IITs as well as declares IT-BHU as Indian Institute of Technology.